One use of LVM that might be worth mentioning. If during an xubuntu install (probably other variants of ubuntu and other distros too) you choose to do entire disk encryption, you end up using some LVM even though you might not realize it. When you do disk encryption, you can’t really use normal disk partitions. When you boot up and the disk is decrypted, it gets mapped to a device file like: /dev/mapper/cryptdrive. That is a block device, but it is not partitionable like a disk drive. 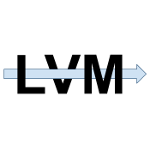 So, LVM is used to turn that block device into a volume group and then logical volumes are created to make up the partitions that you would normally expect, such as a root partition and a swap partition. These logical volumes end up with device paths like /dev/xubuntu-vg/swap and /dev/xubuntu-vg/root. This is all done for you transparently and you might not know about it until you try to mount a disk that had been setup this way and you are like, what the…?